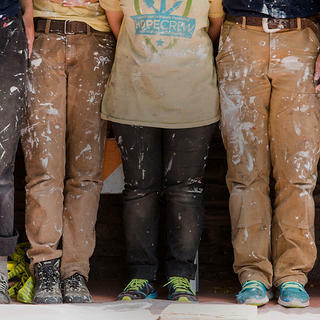 Since 2014, HOPE Crew (which stands for Hands-On Preservation Experience) has completed 165 projects and trained more than 750 young people—including veterans—and engaged over 3,700 volunteers in historic preservation trades. With your support, the program will continue to link preservation projects to local youth organizations and communities across the nation. It brings the potential for thousands participants to restore hundreds of historic sites, while learning preservation trade skills. Your donation will help to empower a new generation of preservationists, who will learn preservation skills while saving places! To enable HOPE Crew to successfully complete rehabilitation projects at historic sites, we determine if the project could support a large-scale community volunteer effort or paid training opportunity for participants. Both project types leverage the National Trust’s broad network of partners and preservation experts to provide preservation guidance and trades expertise. During paid training projects, a trades professional expert, paid through the project’s budget, helps train the crew on techniques like repointing, carpentry, and window restoration. We are always on the lookout for experts to add to our network. If you are interested in serving as either a trades expert or offering preservation guidance on an upcoming project, please submit your information. HOPE Crews continue to preserve historic sites that exemplify to the breadth and depth of America’s past. From iconic civil rights monuments and Native American sacred sites to centuries-old cemeteries and battlefields, HOPE Crew offers enriching and tangible opportunities to connect us all to the past.